The B-2 bomber is one of the most deadly weapons of war in existence today. They have never been detected or targeted in battle and carry a deadly payload whose intent isn’t friendly. I’d hate to be at war with a nation in possession of these flying beast. It gives me visions of sneak attack sky roast. This documentary begins with a review of the history of aerial bombing leading up to modern war technology. 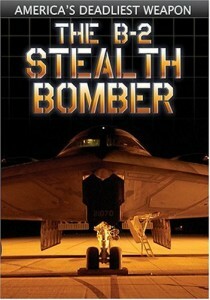 The B2 bomber is capable of going anywhere in the world undetected. The stealth bomber has never been targeted or detected when flying over enemy airspace and is the most advance flying machine soaring the skies today. The B2 bomber gets its roots from the days of World War I and World War II. The design of the B2 Stealth Bomber is based on a flying wing concept (YB-49) by Jack Northrup.